Looking for cool baby shower gifts? 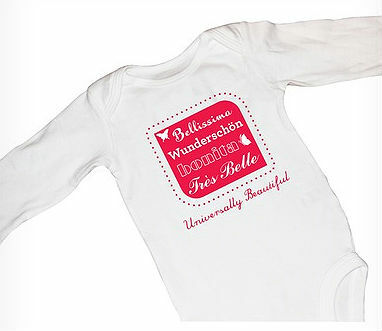 We’ve been looking too… here are some great gift suggestions…from a few great baby stores! 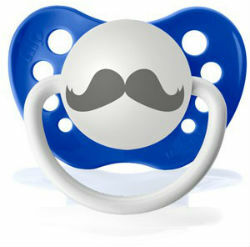 From Coolpacifiers.com personalize one of your own! 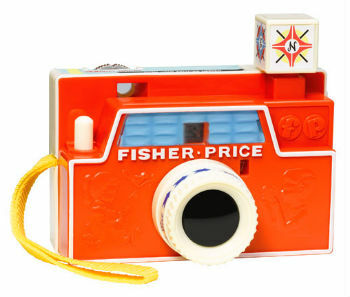 Do you remember this fun little toy from Fisher Price? I love that FP has brought back many of their classics toys for a whole new generation to enjoy! 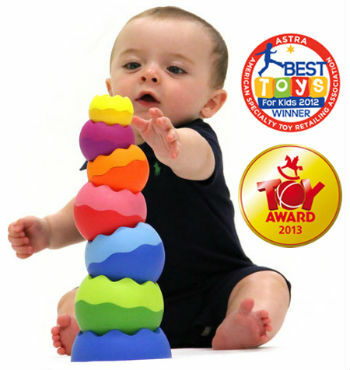 For over 10 years, Fat Brain Toys has been delivering toys that entertain and educate children. 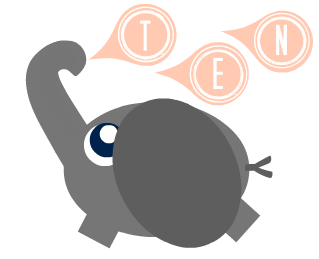 I frequent this site for my own children’s gifts. 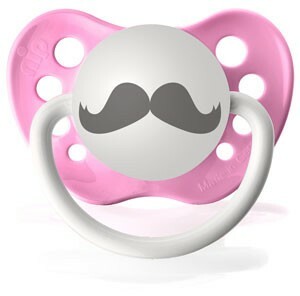 They have really cool stuff for babies and newborns too! From the President of the United States…Did you know the President of the United States will send a congratulatory letter to new parents? This gift will make a wonderful keepsake that’s like no other! The request must be made within one year of the baby’s birth, and only after the baby is born-not before. It would be an honor for us to receive acknowledgment from the White House recognizing the birth of [Name of baby and date of birth and home address]. 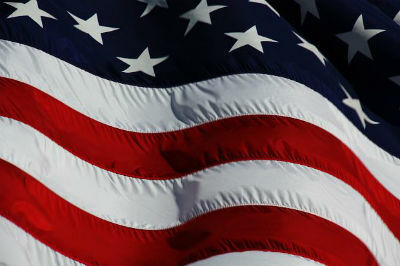 Since this Presidential Congratulations is intended as a gift and surprise for [New parents names and address] I wish to have the letter sent directly to me at: [Your full name and address]. I greatly appreciate your time. I look forward to presenting this wonderful gift to the new parents. The full name and address of the newborn baby. Date baby was born(month, day, year). It’s one of the latest ideas for new baby gifts. You can follow our link to read more about private cord blood banking, how it works, and why new parents are creating gift registries specific to this new baby trend- it’s pretty interesting stuff! Would you register for this gift? Check out easy ways to make your own, cool baby shower gifts! Don’t want to make your own baby gifts, but still think handmade is cool? Here is an amazing handmade gift set from the Etsy website: BabyBlitz.com. If you want to make a baby shower gift- try a craft idea that’s easy and affordable. 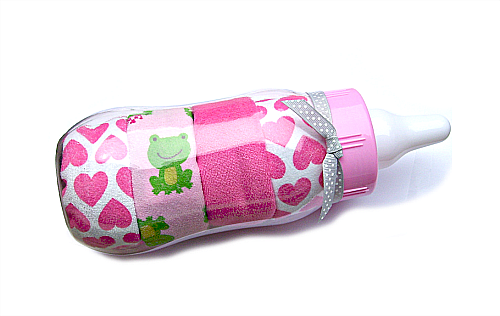 It’s a great gift for twins, baby girls, baby boys, and it’s perfect for a gender-neutral showers . Receiving blankets-you can use solid colors, patterns, or both! Double fold baby blankets into flat rectangles, the folds should be approximately the same height as plastic cups. Roll blanket into a snug cylinder shape that is the approximate circumference of plastic cups.Secure with double-sided tape, if desired. Gently pull the center of rolled blanket in an upward direction, this will create a swirled effect. 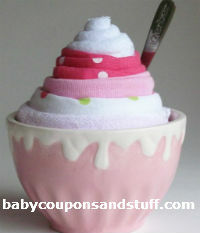 Neatly stuff baby blanket into cup. Don’t be afraid to get creative and make variations of this idea. You can use bibs, socks, burp clothes, and more to make some cool baby shower gifts.